Nevertheless, our exposure to stress might be it can have a big toll on our health, hence my today’s blog. I, like many of us have dealt with stress to the point that I always had palpitation, high heart rate (higher than my usual benign high heart rate), insomnia, and anxiety. However, all that changed when I decided to take the 8 week Mindful Based Stress Reduction class Dr. Gina L Sager. She is a retired board-certified general surgeon, named one of Baltimore’s Top Docs in October 2000. Gina taught us to be aware of the present and be in the moment. I am currently in the 7th week of the class and I have so much difference in the class. You can talk her class in Town for $500 or simply her CDs 10% of the proceed of which will go to HopeWell Cancer Support. I use her Yoga Nidra, a deed relaxing guided meditation CD every night help me fall asleep along with Melatonin. I have to say that has been a lifesaver for me. I also use her guided Sitting meditation CD during my one hour subway commute to work everyday that help feel focused and ready to take on the day with all my attention even with my ADD personality. During one my long morning commute to work, a lady tapped my shoulder while I was on my meditation mode, and gave a local Washington Post Express newspaper pointing to a particular newspaper article, and saying “this is you”. What was interesting was that she observed it right. The lady in far left was like me. This is what I do everyday. So I am not alone. The article provided the following mindful commuting tips: 1) Focus on your surroundings: Focus you attention from when you will get to you destination to what you notice via your senses, like the sounds, the feel of you feet touching the ground, or places of your body that feel tense. 2) Focus on your breath: If you’re not riding a bike or driving take five slow, deep breaths, then return to normal breathing but try to notice each breath and the space between breaths. 3) Refuse your thoughts: you red lights or stops on a train or bus as a reminder notice whether you’re lost in though. Then refocus on your breathing or your senses. There are some great free apps with guided meditation. The one that I love that most is Calm. It’s free in both Google Play and Itunes. This app can help you meditate, sleep, relax, focus and much more. Don’t let stress take over your health and life. 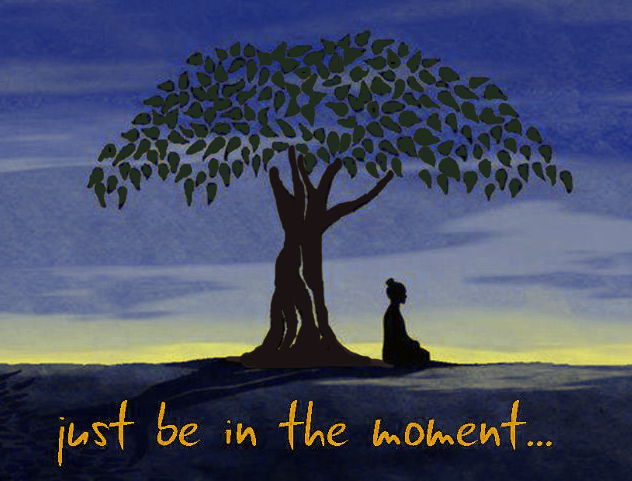 Let’s start by focusing on the moment and being aware of the present. However, in on order to conquer stress to we have to be aware of our feeling. This entry was posted in Health and tagged Calm, Guided Meditation, Mindfulness Based Stress Reduction by allaboutme31. Bookmark the permalink.